In May of 2013 I attended CSSConf and saw Lea Verou speak about the humble border-radius. It was an eye-opening talk and I realized there was much about CSS behavior I did not fully understand. This reminded me of my time as a fine arts student where I was constantly pushed to become a master of my chosen medium. As a web designer, CSS is my medium and so I challenged myself to learn all I could about it and to explore and experiment with its limits. But why a single div? When I was learning to paint, my class did these color mixing exercises where we created the many colors of the spectrum from only the three primary colors: red, yellow, and blue. The purpose of the exercise is to learn the behavior of the medium and the constraints show us the power of combination. You can certainly buy green paint, but you can also create green from blue and yellow. Restricting your available options forces you to re-evaluate the tools you already have. I decided to start a CSS drawing project, every few days illustrating something new with only CSS. To further challenge and explore what CSS is capable of, I gave myself the constraint of using only a single div in the markup. Instead of buying green paint (or adding another div), I’d need to stretch and combine CSS properties to achieve my goals. With only a single div and browser-supported CSS properties, it may seem like the tools are too limited. I found it’s not always what you have to work with, but how you look at them. With CSS and one element, we are afforded three basic shape types. We can use width and height properties to create squares/rectangles, border-radius to create circles/ellipses, and border to create triangles/trapezoids. There are others we can create with CSS, but most things can be simplified to some combination of these shapes. And these are the easiest to create and manipulate. With multiple box-shadows, we can create many versions of the same shape in varying size, color, and blur. Offsetting them on the x- and y-axes gives us almost endless multiples. We can even give our box-shadows box-shadows. Pay attention to the order they are declared. Again, It’s helpful to think of them as layers. Gradients can be used to add shading and depth by implying a light source. This makes the simple, flat shapes feel more realistic. Combining multiple background-images allows us to use many, layered gradients to achieve more complex shading and even more shapes. The most difficult part is visualizing how to piece these parts into a whole recognizable drawing. As much as I focus on the technical aspects of the drawings, this part of the process is critical. To help with this, I’ll often look at a photograph of the subject and break it up visually into pieces. Everything is a shape and everything is a color. I simplify the overall picture into smaller shapes or blocks of color I know can (or suspect can) be achieved with CSS. Let’s take a closer look at two drawings and break down some of the pieces that make up the larger pictures. First up is the green crayon. 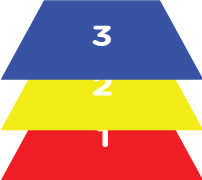 A crayon is made up of two primary shapes: the rectangular body and the triangular drawing tip. Then I added a left-to-right linear-gradient to create the wrapper. It has an alpha value of .6 so some of that previous gradient shows through. Next I used the same left-to-right gradient technique to create the printed stripes on the crayon. And for the printed ellipse, a radial-gradient works great! So after completing the div, I moved on to the :before pseudo element to create the crayon’s triangular tip. Using solid and transparent borders, I made a triangle and positioned it next to the div I just drew. It looks a little flat next to the crayon’s body, but it will be fixed with the :after pseudo element. With this, I added a top-to-bottom linear-gradient to create a reflective gloss effect that spans the width of the crayon. This adds even more dimension and realism and helps with that flat triangle. As a finishing touch, I added some text content to the :after and positioned it as another printed element on the crayon’s wrapper. The crayon is a good example of using background-image and gradients to produce realistic results. Here’s an example that shows the power of multiple box-shadows: a single div camera. 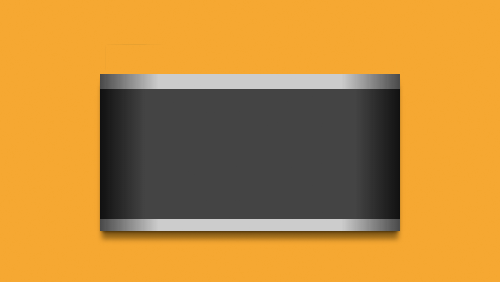 Here’s the body of the camera, created with background-image and border-image. Here’s a gif illustrating the :before pseudo element (the black rectangle) and the many details created with its box-shadows. Similarly, here’s the :after (the grey circle) and its several box-shadow details. A little crazy, but as you can see, multiple box-shadows can add a lot of detail to a single div drawing. Two of the biggest obstacles I came across were limitations around triangle shapes and the natural behavior of gradients. With gradients, their natural behavior is to fill the entire background. This can get a little tricky when layering multiple gradients on top of each other. It takes some extra time to think through transparency, z-index, and understanding what will and won’t be visible. By using this technique effectively, our drawings can have surprising detail. 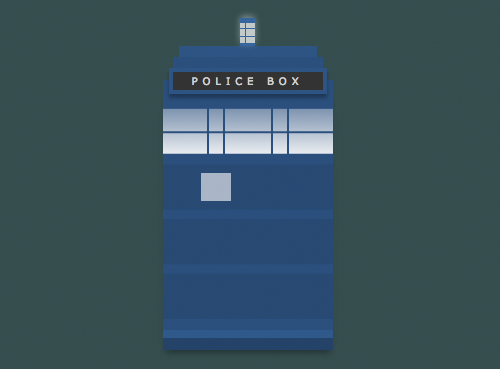 The Tardis is a good example of showing and hiding gradients to create a detailed picture. Here’s the drawing mid-process that shows some of the top-to-bottom gradients that span the entire width of the container. Using left-to-right and right-to-left gradients, I was able to cover parts of the gradient and leave some parts exposed. 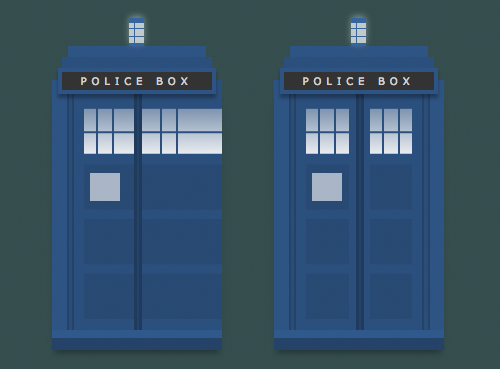 The resulting drawing appears to have many shapes making up the front facade of the Tardis, but it’s strategically layered linear-gradients. Sometimes you have to fake it. Lynn Fisher is an artist and designer based in Chandler, Arizona. She works with the fine folks at &yet where she designs and develops interfaces and occasionally draws pictures. She loves mixing art and technology and improving the way designers and developers work together. Looks nice! Is there only a WebKit version? Awesome! It’s articles like this that really helped me get started with CSS drawing experiments. Wuau!!! This is really cool! I didnt know that you could do such great things just with CSS. Well, I really want to learn things like this. Oh my god! This is so cool. The tardis is really impressive. CSS is taking less space than an image for sure. Wow! What a great article! Never thought about using CSS in this way. Thats really cool man. Loved it.